On April 18, 2016 the United States Supreme Court heard arguments in the lawsuit United States v. Texas, a lawsuit brought by 26 states, led by the state of Texas, challenging President Barack Obama’s executive actions on immigration. These executive actions include the expanded Deferred Action for Childhood Arrivals (DACA) program, and the new Deferred Action for Parents of Americans and Lawful Permanent Residents (DAPA) program announced by President Obama in November of 2014. Following this announcement, the Obama administration received push back from the Republican led House of Representatives. There was also public outcry from conservatives, when President Obama announced that these programs would not only shield eligible individuals from deportation, but allow them to obtain employment authorization. In February 2015 these initiatives came to a screeching halt, when a federal district court granted these states a preliminary injunction preventing the implementation of expanded DACA and DAPA to take place. Since then, the lawsuit has moved through the courts, and now remains at the Supreme Court. On Monday April 18th eight justices heard oral arguments in the case arguing for and against these executive actions on immigration. A final decision is expected from the justices in June. The Director of Advocacy at the American Immigration Lawyers Association (AILA) Greg Chen, AILA’s Legal Director Melissa Crow, and UCLA Law Professor Hiroshi Motomura weighed on what happened in the court Monday morning and what we can expect from the Court moving forward. 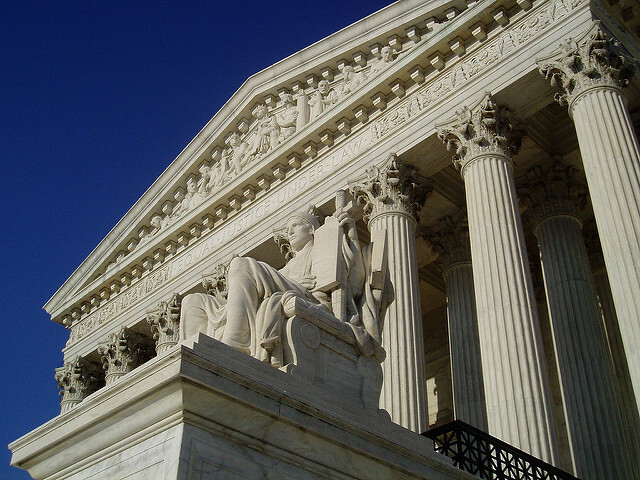 The experts identified 2 key issues that were discussed during Monday’s oral arguments. Threshold question: Whether or not the Supreme Court should consider the case in the first place. The court asked themselves if the plaintiff states have standing to sue in the first place to bring the case to the court. The Merits of the case: Whether or not the President has the authority to implement these executive actions based on the ‘Take Care’ clause of the constitution. Greg Chen highlighted that this case is particularly important because for the first time in 20 years, we have not seen any real immigration reform from any of the three branches of government. Chen also noted that these executive actions on immigration, if implemented, would shield millions of undocumented immigrants from deportation. States also have a huge interest in passing these executive actions for the economic and tax revenue benefits alone, since undocumented immigrants have not been able to properly abide by tax laws due to their unlawful presence in the United States. Melissa Crow highlighted that in Court proceedings, the traditionally four ‘liberal’ justices on the bench Breyer, Sotomayor, Ginsburg, and Kagan seemed to be sympathetic to the Obama administration in the questions they posed to the attorneys representing both sides in this lawsuit. Melissa noted that in order to overturn the federal injunction halting expanded DACA and DAPA, a fifth vote is required from the conservative camp either from Chief Justice Roberts or Justice Kennedy. The questions posed by the traditionally ‘conservative’ justices did not necessarily provide clues into their stance on these issues. Their questions simply showed that they were engaged in the issues and mostly focused on the issue of standing to sue. a citizen or national of the United States; or an alien: lawfully admitted for permanent or temporary residence in the United States; with conditional permanent resident status in the United States; who has an approved application for asylum in the United States or has entered into the United States in refugee status; who has a valid nonimmigrant status in the United States; who has a pending application for asylum in the United States; who has a pending or approved application for temporary protected status (TPS) in the United States; who has approved deferred action status; or who has a pending application for lawful permanent residence (LPR) or conditional permanent resident status. A person in lawful status may be eligible to legally work in the United States without having yet achieved ‘lawful presence’ as is the case for recipients of the existing DACA program. Motomura further discussed the observation that the justices in the ‘liberal’ camp were not shy about revealing their thoughts on how they felt about the merits of the case. The liberal justices did a good job of separating out issues regarding how deferred action is different from employment authorization, issuance of driver’s licenses, and the different sources of authority granting these benefits. Professor Motomura was most impressed by the arguments posed by the U.S. Solicitor General on behalf of the federal government and the attorney representing three undocumented mothers who would be eligible for the expanded DACA program. In his view the attorney for the mothers was able to successfully summarize the reasons why the plaintiffs in his view do not have standing to sue, and also states that one of the reasons why DACA recipients should be allowed to intervene in this lawsuit is because they have “a justifiable claim to a process that allows them to access deferred action remedies in a nondiscriminatory way and predictable way.” He would have liked to see him speak more about this point, however the attorney ran out of time since he spent most of his argument addressing standing to sue questions posed by the Justices. Lastly, Hiroshi commented that he was more concerned by the questions that did not come up in Court, than those that did. For example, he pointed out that the Court was so preoccupied with standing to sue and the merits of the case, that it did not bring up the ‘Take Care’ aspect of the case. According to Melissa Crow, two important questions were raised by conservative Justices Kennedy and Roberts during Court. Justice Kennedy asked the U.S. Solicitor General whether the lawsuit should not have challenged the executive order itself, rather the suit should have challenged the regulation of employment authorization brought under the Administrative Procedure Act. Justice Roberts asked an interesting question about standing to sue bringing up the case Massachusetts v. EPA in which he dissented. According to Crow, in that case the court held that a state had standing to sue, and that states should be given special solicitude when they bring such a challenge to Court. Roberts disagreed with the Court in that case. Justice Roberts asked the U.S. Solicitor General if the harm alleged by the states was more ‘incidental’ and ‘speculative’ than in the Massachusetts case. The solicitor general responded that it was much more ‘incidental’ and ‘speculative.’ According to Crow if the majority of the Court were to find that this is the case, Texas and other plaintiff states would not have standing to sue and the case would be dismissed. This would be the ideal situation if expanded DACA and DAPA were to prevail. This point is also important, because Justice Roberts is alluding that this may be his view on the standing to sue question. Crow pointed out that Justice Kagan questioned attorneys of the opposition regarding what the real issue was for the states. She asked whether or not the case really was about employment authorization or whether the States maintained a hidden agenda. Greg Chen pointed out that Justice Breyer stated that if the Court were to find that Texas and the other states were found to have standing to sue, there would be major implications for the Court in the future. Chen argues that this type of ruling would ultimately, “enable states to sue the federal government for any kind of major federal program that has an impact on the states.” He argues that this type of ruling would change the way immigration is done and administered by federal agencies. The U.S. Solicitor General further agreed with this point. On this point, Professor Motomura responded that certain scenarios were discussed in Court where the state of Texas would be harmed by Justice Roberts. He explained that these scenarios were quite hypothetical and would ultimately require the Court to speculate on the filing and the outcome of lawsuits that have not yet been filed. According to Hiroshi, a ruling that would find standing to sue on behalf of the states would raises Article 3 problems. He suspects that standing to sue would be found by the Court in limited situations for cases in controversy. What the plaintiffs in essence are asking of the Court is an advisory opinion. Hiroshi added that Justices that are Skeptical of Texas’ standing might state that Texas’ arguments of harm are based on hypothetical cases that have not yet been filed. Melissa Crow added to this issue stating that the argument that the executive actions raise a level of harm that would be detrimental to Texas is based on false premises. Crow argues that Texas’ own laws would allow DACA/DAPA recipients to obtain a driver’s license with deferred status. If Texas was being genuine about the harm they would suffer, she argues they would make changes to their own laws preventing DACA/DAPA recipients from seeking ancillary benefits. Crow argues that the lawsuit is built on false premises, based on this fact. Greg Chen brought up an additional interesting point. He states that a question was brought up in Court of whether or not Congress needs to legislate to enable individuals to apply for work authorization. He stated that the Solicitor General responded that if Texas’ argument is that statutory authority is needed for issuance of employment authorization, more than 30 years of existing regulations by INS enabling many categories of individuals that don’t yet have legal status would be eliminated. Chief Justice Roberts asked him how many individuals would be affected if this were the case to which he responded millions including asylees. Chief Justice Roberts was clearly concerned about the implications for these individuals. The experts were asked what would happen in the case of a 4-4 split decision. Melissa states, “If there is a bad decision, that would mean that the Supreme Court has found that Texas and some or all of the other states have standing to bring this suit in the first place. This could open the courts to a floodgate of lawsuits by states when they disagree with federal policy.” By Crow’s statement this would also mean that sympathetic ‘liberal’ states could file a lawsuit stating that they would be harmed if the federal policy was not implemented for economic, due process, or other reasons. Crow believes that the Justices are mindful that a 4-4 decision would make the court appear to be politicized, and they would like to avoid that at all costs. Hiroshi believes that the possibility of a 4-4 decision is real. If there is a split decision, the Court would not create precedent that could be used against the DACA program, which is a plus for the Obama administration. In Hiroshimi’s view a decision in favor of Texas would allow states and localities to take. He believes the in this scenario, the Justices would rule that certain kinds of state harm don’t qualify for standing, in other words that state harm must be direct and compelling to be brought to Court. Further, he says that he did not see anything in Court transcripts suggesting that give justices would vote to affirm the Texas decision. He believes the side of the court comprising Justices Roberts, Alito, Kennedy remains mysterious. Overall he is not sure what a decision in favor of Texas would look like. Greg Chen agreed with his colleagues on these points. While we do not yet know the opinions of the conservative Justices definitively, we have been able to gain some insight into what the Justices are considering in this case. The issue of standing, and the implications that would result if the court were to find that the States have standing, are big issues for the Justices. In the coming month, we will be able to have a clearer picture of where the Justices stand. To view the complete discussion please click here. For more on the executive actions please visit the USCIS webpage.